But keep the hills and upper regions. Now, Antony, everything is turning out as we had hoped. You said the enemy wouldn't come down into the valleys, but would stick to the hills and higher ground. That proves to be false. Their forces are nearby, and they intend to confront us at Philippi, entering into battle before we force it on them. Ha, I know what they're thinking, and why they're doing this. They would rather be somewhere else, and yet by coming down into the valley with a show of bravery, they hope to make us think that they're courageous. But they are not. To fasten in our thoughts that they have courage. The enemy comes on in gallant show. Make preparations, generals. They enemy is making a show of approaching boldly. They have their blood-red battle standards flying and we must do something immediately. Octavius, carefully lead your forces over to the left side of the level field. I'll take the right side; you take the left. Why are you contradicting me in this urgent situation? I'm not opposing you; but I will take the right side. Stand fast, Titinius. We must out and talk. Octavius was born as Gaius Octavius, but after being adopted by his great uncle Julius Caesar, his name was changed to Gaius Julius Caesar Octavianus. Reflecting his growing political ambitions, he's now going by the name Caesar. Here for the first time, Antony seems to acknowledge his preeminence by referring to him by his new name. They've halted and want to speak to us. Halt, Titinius. We must go out and talk to them. Mark Antony, should we signal our forces to attack? No, Octavius Caesar, we'll wait and respond to their charge. Let's go forward, their generals want to talk with us. [To his officers] Don't move until the signal's given. Will it be words before blows then, countrymen? Yes, but not because we prefer to talk rather than fight, like you do. Make forth, the generals would have some words. [To his officers] Stir not until the signal. Words before blows; is it so, countrymen? "bad strokes" and "good words"
Up to the moment you stabbed Caesar in the heart ("bad strokes"), you were singing Caesar's praises ("good words"). Ironically, your stab wound in Caesar is like a mouth praising Caesar. Good words are better than bad sword strikes, Octavius. With your bad strikes, Brutus, you have provoked good words. I speak of the hole you stabbed in Caesar's heart, a hole that cannot help but cry out to every Roman, "Long live Caesar! Hail, Caesar!" Antony, we don't know if you're an effective fighter, but your talking is so sweet you must have stolen the honey of the legendary Hybla bees. You don't think I took their stingers to use as well? Well you've certainly taken their buzzing to try to scare off your opponenets, since you lack the courage to attack them. O yes, and soundless too! Hybla was—and still is—a district in Sicily famous for its honey bees. In fact, the word "Hyblean" is often used in literature in reference to honey. Cassius claims that Antony has stolen the bees’ honey, because his words are so sweet. Brutus disdainfully adds that Antony has stolen the bees' buzzing in order to scare off his opponents because he lacks the courage to attack them. Hacked one another in the sides of Caesar. "your vile daggers hacked one another"
At least one of the conspirators accidentally stabbed one of his fellow attackers during the assault on Caesar. You villains! You gave no warning when your vile daggers hacked into each other inside of Caesar's body. You smiled like apes, fawned on him like pet dogs, and bowed to Caesar like slaves, kissing his feet; while that damned Casca snuck up like a mongrel dog from behind and stabbed Caesar in the neck. Oh you flatterers! You call us flatterers? Brutus, you only have yourself; Antony would not be alive to insult us today if I my advice had been taken. Look, I draw a sword against conspirators. Come on, let's get to the issue at hand. If arguing is making us sweat, resolving the issue will surely result in bloody drops. Look, I am drawing my sword against you conspirators. When do you think that I'll lower this sword again? Never, until either Caesar's thirty-three stab wounds have been revenged, or until I'm killed and you traitors have the blood of another Caesar on your hands. Caesar, you can't be killed by a traitor, unless they came with you. I hope I won't be killed by a traitor; I wasn't born to die by the sword of Brutus. Oh, young man, if you were the noblest of all your family, you couldn't wish for a more honorable death. Octavius you're just an angry schoolboy unworthy of being killed by Brutus, joining forces with this partying socialite, Antony! Still the same old Cassius. Come on, Antony. Let's go! Traitors, we'll defy you to your faces. If you dare to fight us today, come to the battlefield. If not, wait until you feel brave enough. Join'd with a masquer and a reveller! Defiance, traitors — hurl we in your teeth. Why let the wind blow, the waves swell, and ship sail! There's a storm brewing and everything's at risk. Hey, Lucilius! Listen, I'd like a word with you. Was Cassius born. Give me thy hand, Messala. Messala, this is my birthday; I was born this very day. Give me your hand, Messala. You'll be my witness that I do not want to risk all of our freedoms on this one battle, but I compelled to, just as Pompey was in the civil war against Caesar. You know that I've always admired Epicurus and his philosophy, which denies any influence of the supernatural on human events. I've starting to wonder if their isn't some truth in omens. When we were coming here from Sardis, two eagles landed on our foremost battle flag, perched there and took food from the hands of our soldiers. They traveled with us all the way to Philippi. Who to Philippi here consorted us. But this morning they had flown off, and ravens, crows, and other birds of prey have come to take their places. These fly over our heads and look down at us as though we were their struggling prey. The shadows from these birds seem to make a dark cloud, under which our army lies, prepared to die. I only half believe it. I'm full of vigor and resolved to meet all dangers resolutely. [Finishing his conversation] Believe not so. Lovers, in peace lead on our days to age! It's just like that, Lucilius. Now, most noble Brutus, may the gods favor us today so that we live on into old age! But because one can never predict human affairs, let's consider the worst that might happen. If we lose this battle, this will be the last time we speak to each other. What will you do if we lose? The very last time we shall speak together. What are you then determinèd to do? "the death which he did give himself"
Brutus considers himself a Stoic, and Stoics believed that one should calmly accept whatever comes in life — good or bad — so that’s what he would do. He even criticizes his uncle Cato for killing himself rather than allowing himself to be taken prisoner by Caesar during the civil war. For the same reasons I blamed Cato for killing himself, I find it cowardly and vile—although I don't know why—to commit suicide in fear of what might happen later in life. I will be patient and endure what the gods who rule us have in store for me. Then if we lose this battle, you're content to be led through the streets of Rome as a captive in their triumphal procession? That ever Brutus will go bound to Rome. 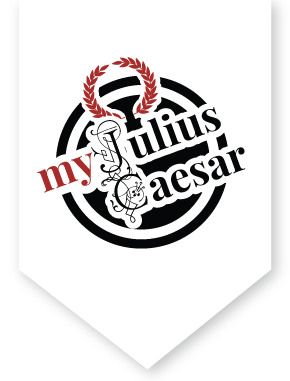 In response to Cassius’ question of what he would do if they lose the battle, Brutus, who imagines himself a strict adherent to the Stoic philosophy, initially gave the expected Stoic answer: he would patiently accept whatever happens in life. But when faced with the image of his being led in chains behind Antony’s chariot through the streets of Rome, he abandons his Stoic principles, acknowledging that such a humiliation would be intolerable. Today will end in either victory or his death. No, Cassius, I am not. Noble Roman, don't think that I will ever be led in chains through the streets of Rome. I have too great a character for that. But today will end what the 15th of March began, and I don't know whether we'll ever meet again or not. Therefore let's say an everlasting farewell. Farewell forever and forever, Cassius! If we do meet again, we'll smile thinking about this. If not, then we have parted well. For ever and for ever farewell, Cassius! Farewell forever and forever, Brutus! If we do meet again we'll definitely smile, and if not then it's true these were goodbyes well said. Why then, lead on. Oh, if only men could know the outcome of a day's endeavor before it's begun! But it's enough to know that the day will end, and then the end will be known. Come on, let's go! And then the end is known. Come, ho, away!